Is it white gold you’re after? This 18K White Gold Seam Ring w/ CZ & Turquoise Opal Cluster by Anatometal is loaded with personality! 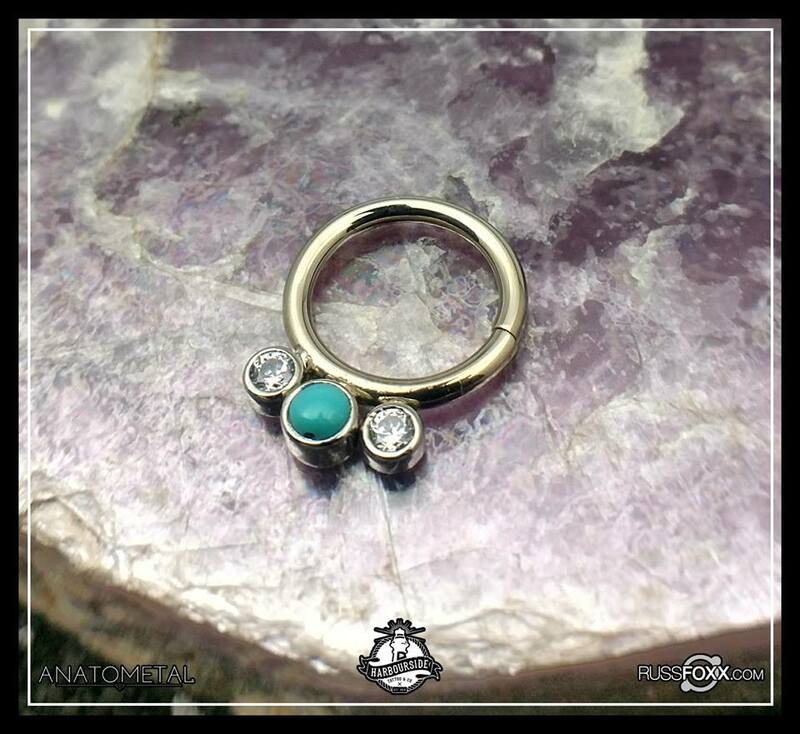 Perfect for a septum or daith piercing! Come visit us at Harbourside Tattoo and check out our selection of the finest body jewellery the piercing industry has to offer! We have gorgeous pieces to fit any budget. 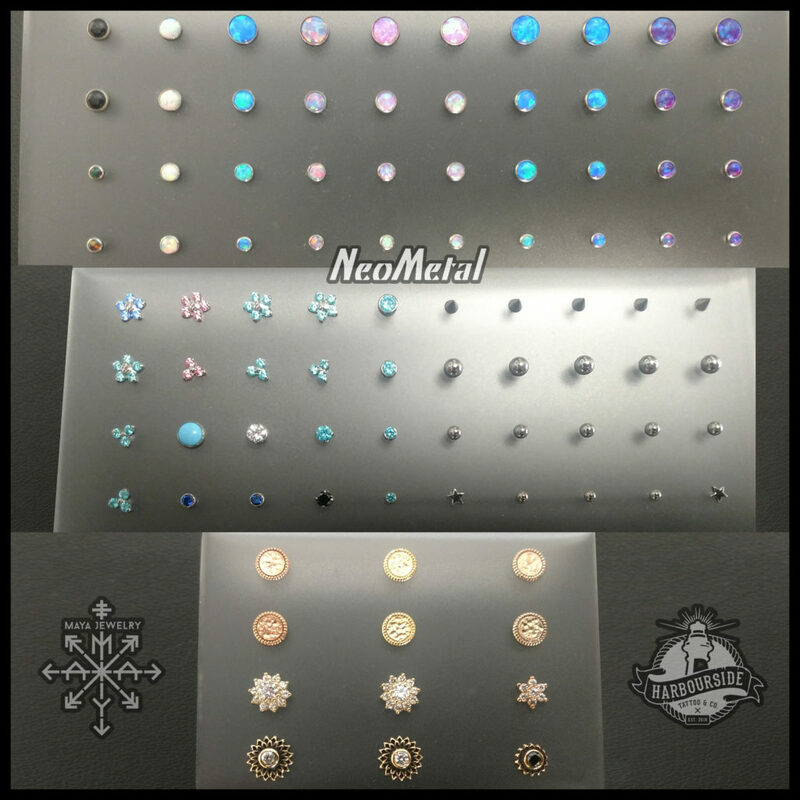 Our Threadless Ends Selection by Neometal and Maya! 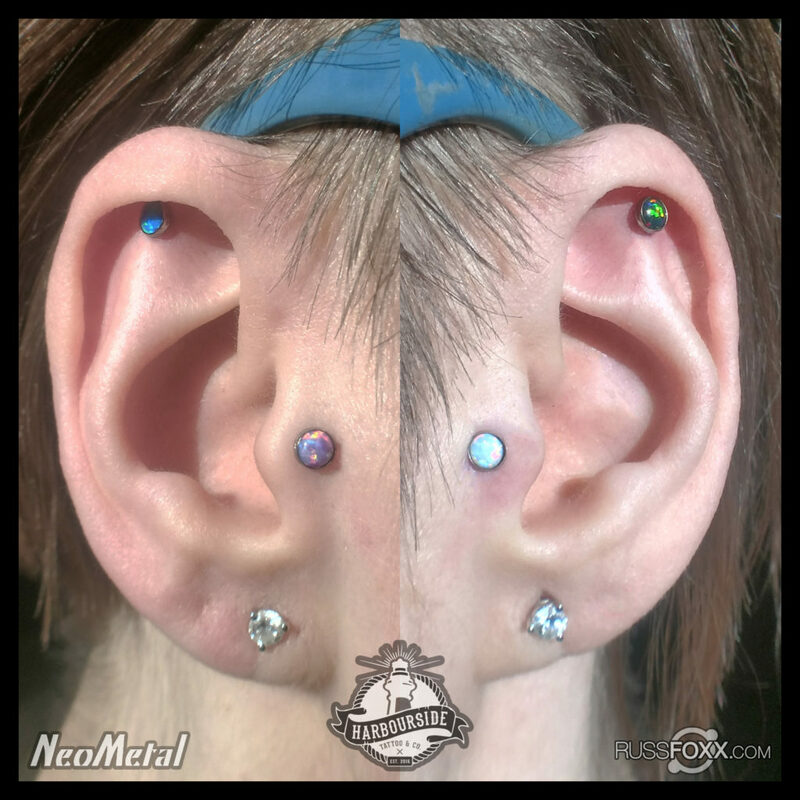 Our current threadless ends selection in titanium by ‘a href=Èhttp://www.neometal.com/”>NeoMetal Titanium Body Jewelry and 14k gold by Maya Jewelry! These are great for most ear, lip and nose piercings! All titanium ends can also be anodized in-house to any colour. PSA: We offer safe piercings with high polish finish implant grade jewellery and sterile single-use needles. Piercing guns cannot be sterilized, increase trauma, are not operated by trained body piercers and use poorly designed cheap jewellery. Avoid them like the plague! 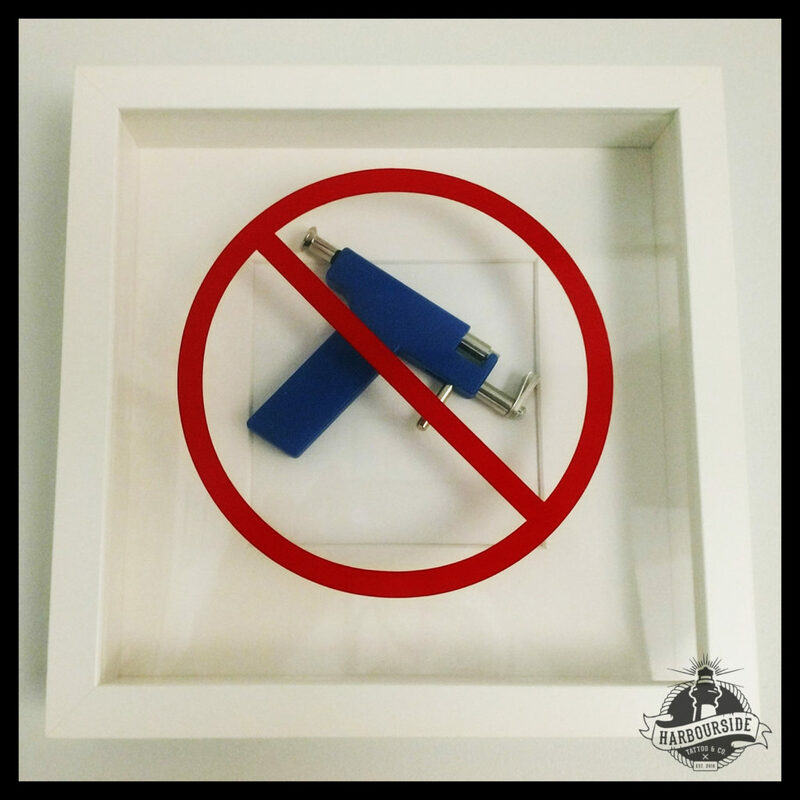 The only piercing gun we own is on prominent display to show that we DO NOT pierce with them. Ever. Big thanks to Michael Hare for putting this together for us! Check out our 14K Gold Diamond Milligrain w/ Clear CZ Internally Threaded Ends by LeRoi Fine Jewelry! Great for your philtrum or labret centerpiece or dressing up your various ear piercings! 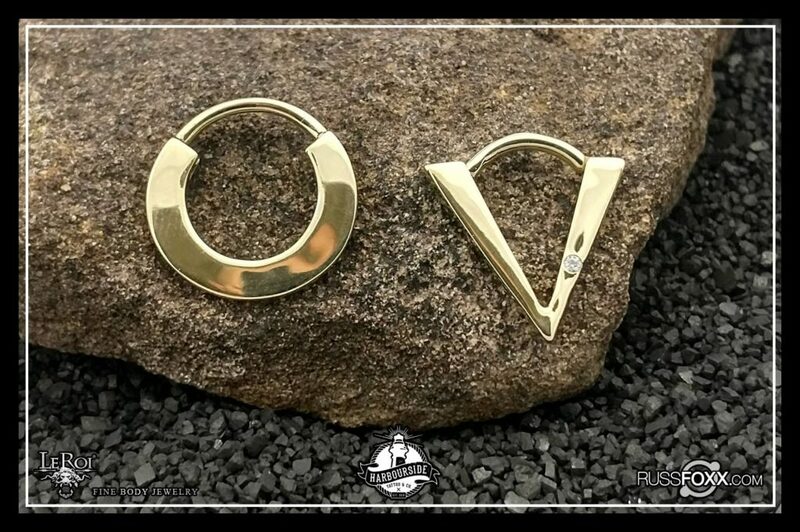 Come check out our huge selection of the finest gold, brass, bronze, titanium and glass body jewellery! We are doing a day trip to Vancouver Island this coming Sunday Jan 7! Contact me if you’d like us to fit you in for any work while we’re in town! 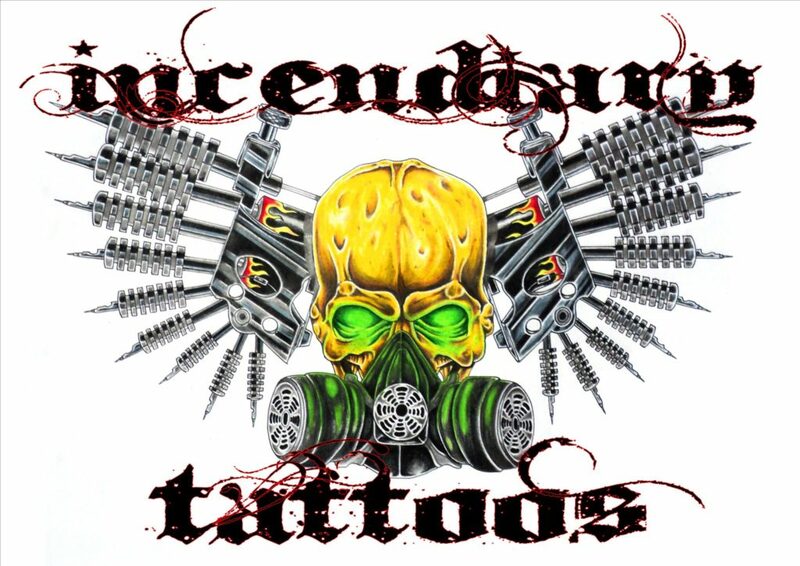 We’ll be available by appt only at Incendiary Tattoos at 890 Esquimalt Road! 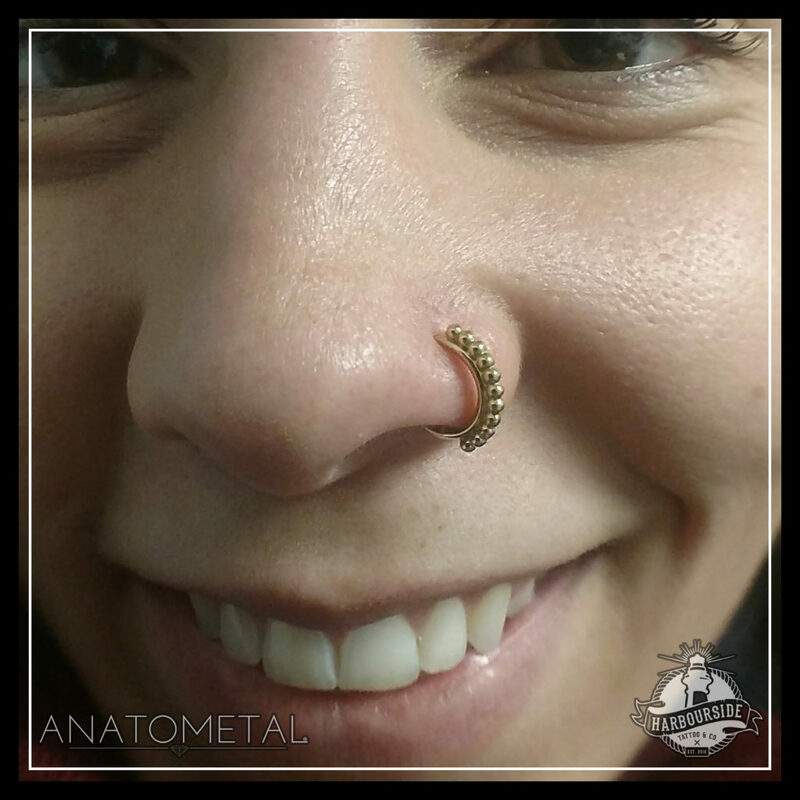 Sam just popped by Harbourside and had us dress up her nostril with this sleek 18k gold Vaughn Seam Ring by Anatometal! Come visit us for the best body jewellery the piercing industry has to offer. We have gorgeous pieces to fit any budget. Here’s a video sneak peek of our current jewellery display featuring Maya Jewelry​, Diablo Organics​, LeRoi Fine Jewelry, Ganesha Ear Weight Designs​, NeoMetal​, Zadamer Designs, Infinite Body​, Identity Custom Body Jewellery​, Industrial Strength​, Anatometal​, Gorilla Glass​, Symbiotech Studios, Kaos Softwear​ & Cyborg Nest​. Coming soon: Alchemy Adornment​, body vision los angeles​, Maria Tash – Fine Jewelry​ & More! 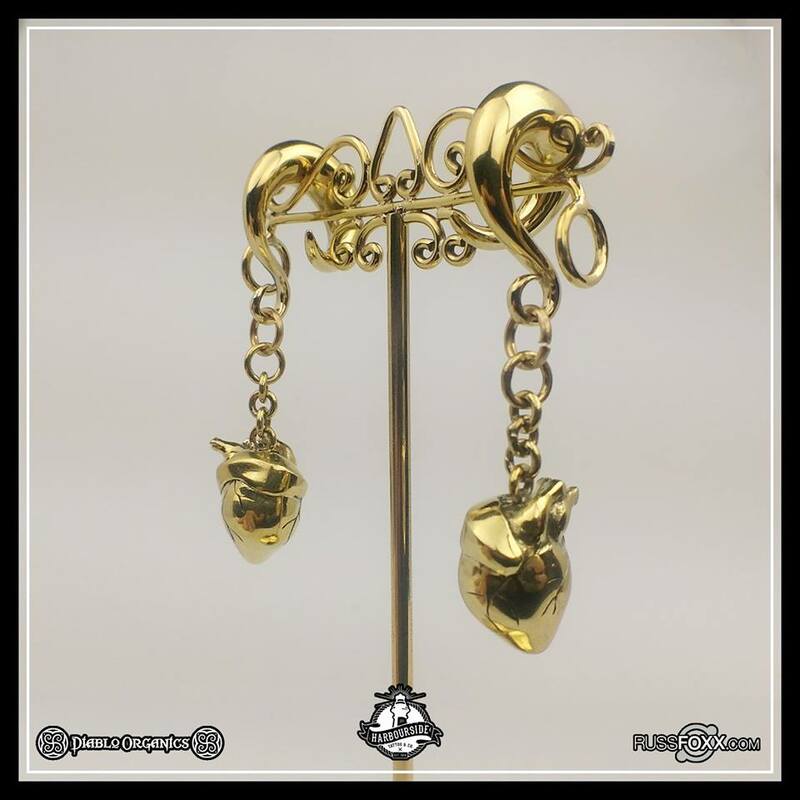 Check out this pair of Solid Brass Anatomica Ear Weights w/ Solid Brass Classic Coil by Diablo Organics we have in! Come see us at Harbourside Tattoo & Co and check out our selection of the industry’s finest gold, brass, bronze, titanium & glass! We are also taking orders from those outside of Vancouver. 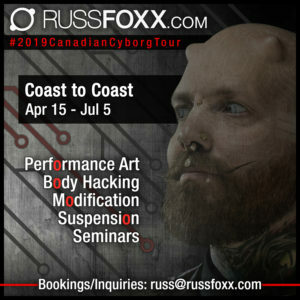 Email russ@russfoxx.com to inquire. Here’s a shot of some fresh paired tragi and outer conch piercings we just installed with some Threadless Titanium 4mm Synthetic Opal Cabochons by NeoMetal Titanium Body Jewelry! Come visit us at Harbourside Tattoo & Co and check out our selection for yourself! These can be used for most ear, lip and nostril piercings! Only One 14k Clicker Left from LeRoi fine Jewelry’s Geometric Line! 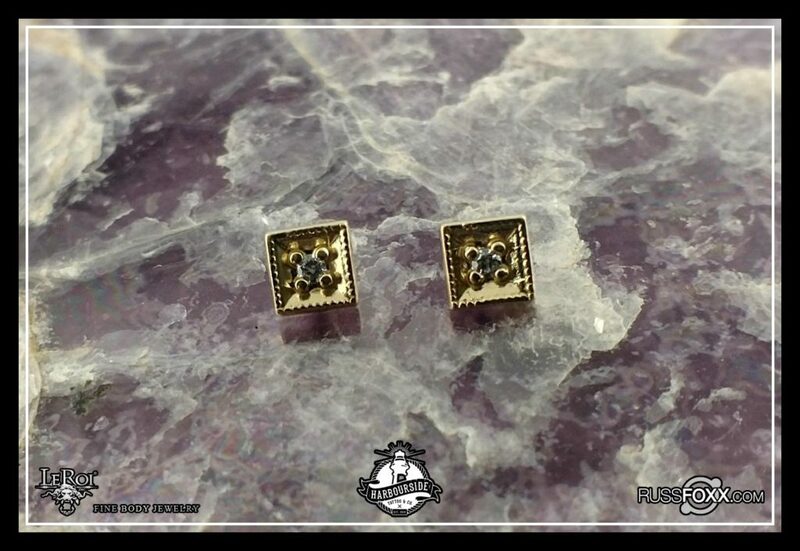 We are down to our last 14k Gold Clicker from the Geometric Line by LeRoi Fine Jewelry! The Triangle w/ Gemstone is up for grabs! Come visit us at Harbourside Tattoo & Co and feast your eyes on our gorgeous display and selection of the industry’s finest body jewellery!